Public knowledge and legal opinion have yet to catch up to the massive state spying enabled by new technologies. If this sounds absurd, we can hope that today’s arguments on the forfeiture of privacy in a digital age will someday sound equally ridiculous. The telephone was still a relatively new technology in 1928, as cellphones and the Internet are today, and the law had not yet adjusted to its use. It took thirty-nine years for the Supreme Court to catch up with the times and reverse Olmstead. In Katz v. United States, the Court devised a new test to determine the Fourth Amendment’s jurisdiction—“first that a person have exhibited an actual (subjective) expectation of privacy and, second, that the expectation be one that society is prepared to recognize as ‘reasonable,’” as Justice John Marshall Harlan wrote in a concurring opinion. Thereafter, wiretaps required warrants. So it may eventually be for the massive collection of cellphone locations, numbers called and received and e-mail addresses (including subject lines)—all of which the National Security Agency has been sweeping up in an effort to map interconnections among the suspicious and the innocent alike—just in case. This “metadata,” as it’s called, may actually provide a more complete picture of a person’s private life than the transcripts of a few phone conversations. Indeed, in 2011, Democratic Senator Ron Wyden of Oregon rose on the Senate floor to denounce the NSA’s collection, which he could not describe because it was classified, by insisting that “when the American people find out how their government has secretly interpreted the Patriot Act, they will be stunned and they will be angry.” Judging by the polls and the debate, it seems that he overestimated the American people. The future judgment about the program—both its constitutionality and cultural acceptance—will turn on how the “expectation of privacy” is defined, for that remains the main test of where the Fourth Amendment’s protection begins and ends. The boundaries of privacy have grown very blurry in an age when we practically disrobe at airports, share our inner torments on Facebook and Twitter, don’t mind advertisers’ following us from website to website and happily allow weather and traffic apps to know where we are at all times. So how do we draw the line between what we want known and what we don’t, or whom we want to know it? Is there a difference between giving information to our bank and to the FBI? Between Verizon and the National Security Agency? And if so, what firewalls should be placed between them? What tests should government have to meet to obtain and use information that we find convenient to provide to third parties? This is a key question that should be at the heart of the current debate over the NSA disclosure, for it will guide the way forward. The question has both pragmatic and constitutional components. It asks whether huge sweeps of data from innocent Americans actually prevent significant terrorism; the government’s assertion demands substantial proof, so far lacking. It asks whether the seasoned constitutional traditions of the country are being damaged—not just in the short term but in the longer range as well. The debate is inadequate so far. It cannot penetrate deeply enough into reality without substantial declassification of government secrets—and not just by a self-serving government, but by an independent commission that would be authorized to examine the NSA’s practices through clear eyes. Furthermore, the online, smartphone, digital, perpetually connected revolution is here to stay, so it is not enough to argue whether all this metadata should be collected. If telecom firms have it—and they do—the government will get it unless officials have to go through serious hoops to prove that they absolutely need it for national security. “If you keep it, they will come,” Alan Davidson told me a few years ago, when he was Senior Policy Counsel for Google. Therefore, the task now should be to look ahead to how the formidable powers of the state can be managed effectively in this new era—not to turn off the NSA computers but to install a strict regime, enforced by the judiciary, of clear rules about the access, use and automatic destruction of data. This is not impossible; the geeks know how to do it. ThinThread, for example, an NSA program that was abandoned, was designed to filter out communications from US citizens and legal residents, and to monitor analysts to be sure they did not intrude illegally into the data. We are in an extremely fluid moment technologically and legally, one that cries out for the executive, Congress, and the courts to inventively protect privacy and enhance security at the same time. The current program may be illegal or unconstitutional. Despite President Obama’s assertion, which has been echoed unquestioningly by various pundits and congressional leaders, it is far from certain that both the legislative and judicial branches properly signed off on the NSA’s dragnet. The Foreign Intelligence Surveillance Act—passed in 1978 as privacy legislation after disclosures of FBI domestic spying on civil rights and antiwar groups—was loosened by the 2001 Patriot Act and further relaxed in 2008 amendments, but it does not necessarily authorize the wholesale, suspicion-less sweep of metadata. 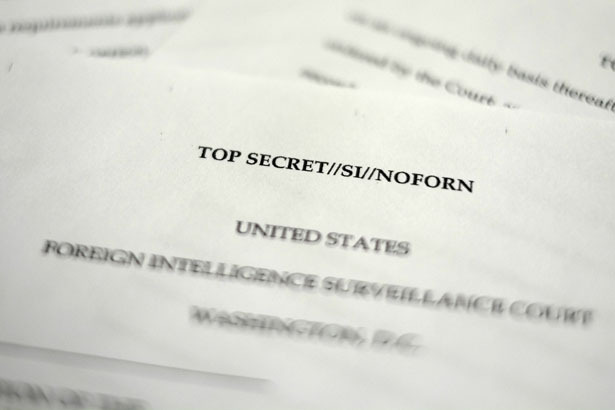 The judge of the Foreign Intelligence Surveillance Court may have exceeded his authority. In another case—the GPS decision—the Court showed sensitivity to the overwhelming intrusion of technology when it ruled unanimously that police need warrants to attach tracking devices to vehicles. This was significant, because the streets are public places where nobody has an expectation of privacy, and where individual police officers may therefore follow drivers without warrants. The multiple opinions of the justices suggested that some, at least, were poised to revisit the expectation of privacy in a digital age. If that means acknowledging that you can’t live in the twenty-first century without giving information away, and that you don’t lose control of your information by doing so, it would be, well, stunning. Rick Perlstein explains what Glenn Greenwald got wrong. David K. ShiplerDavid K. Shipler, a former New York Times correspondent and Pulitzer-Prize winner, is the author of two books on civil liberties: The Rights of the People and Rights at risk.